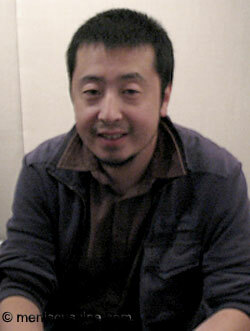 Jia Zhang-ke’s mesmerizing and meditative documentary “Useless” screened at the 2007 New York Film Festival. Earlier this year, the film received the Horizons Documentary Award at the Venice Film Festival. I sat down with the director shortly after the press screening and conference on October 12, 2007, to discuss the film. Interpreting for Mr. Jia was William Phuan, Program Manager at Asian CineVision. Meniscus: What was it that made you move into the documentary arena? As you said at the press conference, your fiction films already have a sense of documentary. Jia: For my narrative films, it’s usually through my long-term observation of certain things. I know my subject better in my narrative films, but for documentaries it’s a certain curiosity that I have about certain things in life that I’m not very familiar with. So that’s how I’m using documentaries, to find out more about these things happening in life and to interrogate the relationships. You mentioned that “Useless” is the second film of a trilogy. Who will be the subject of the third film? That film will be about an architect, because right now in China there’s a lot of construction and destruction, and there’s all these relationships that I’m really interested in, so I’m looking for an architect right now. What made you choose these specific artists – Liu Xiaodong in “Dong” and Ma Ke in “Useless” – to profile in these films? I assume you have some sort of affinity with these artists. Liu Xiaodong [in his paintings] records the daily lives of workers in China, which is not very common in China. He goes to the Yangtze River to draw all these people using natural lighting and the energy of the air. For designer Ma Ke, there’s this element of memory in her design, which is really important because there’s all this erosion of the past. So it’s through her design that you can [recover] the history and memory of the past. And it’s also very important that these two artists are not isolated; they’re very engaged with the daily life of the whole society. What I liked about the film was how you go through all these different strata of society, but you let the audience make their own connections between them without overtly imposing a particular point of view. Could you talk a little about your editing process? The first problem in editing is deciding which section should go first. So I decided to [start with] the assembly line in Guangzhou because those workers seem to form the lowest strata of the clothing industry. Ma Ke and the artisanal workers in Shanxi have a relationship. They form a social circle, but the assembly workers seem to be separated from the rest. So what I really want to do is get shots that focus your attention and force you to pay attention to what’s happening because of the speed of development in China right now. What was most interesting to me about both “Dong” and “Useless” was how, as you say, the subjects are not seen in isolation. I love the scene where Ma Ke drives to Fenyang and then leaves the film altogether, leaving us to remain in the village observing the people who live there. I really like to change the focus from one segment to another. Making documentaries is for me a way to break down barriers and to look at different layers of reality in life. You said at the press conference that you want to highlight the contradictions in Chinese society in your films. And it seemed to me that there may be contradictions within the artists that you profile. Liu Xiaodong’s art is based on common people, but his work hangs in art galleries, which one would imagine are inaccessible to the people he depicts. Similarly, Ma Ke makes clothes that are nearly impossible for normal people to wear. Do you think they are conscious of this apparent contradiction? What they’re able to achieve is much bigger than what they are right now. Even though they have this freedom to create what they like, even though they have a better [standard of living], it still doesn’t cut them off from everyday life. Through their art, these artists can talk about the condition of the people, the plight of the masses. There are many realities that have been cut off from people, so what [these artists] can do is to peel away these layers and reveal these realities. Do you see your films as a document of things that are disappearing? Is this a major impulse in your work? I see movies as a tool to record memory. In China memory is not really valued or treasured, so it’s really important for these movies to record what has transpired.